“Never doubt that a small group of thoughtful, committed citizens can change the world; indeed, it’s the only thing that ever has.” Add prayerful to thoughtful and Prof Margaret Mead’s oft used quote describes SAFCEI’s objective of shifting the South African government’s energy priorities from nuclear to renewables. The dedicated Earth Keepers who hold anti-nuclear posters and hand out brochures outside parliament every Wednesday find strength in their commitment to eco-justice and their understanding of the devastating environmental and economic consequences of nuclear energy. The word is spreading as more people stop to ask questions and take an information brochure. 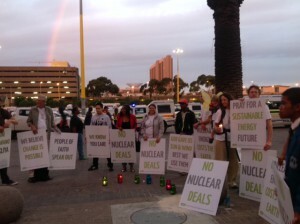 The nuclear vigil held on Cape Town’s Grand Parade just before the State of the Nation address captured the interest of media and officials on route to parliament. Both News 24 and SABC Morning Live have recorded live interviews with Liz McDaid, SAFCEI’s energy advisor, and faith leaders at the nuclear vigils. If you’re unsure about the risks of the government pursuing more nuclear as part of our energy mix, consider these quotes from SAFCEI members. “SAFCEI believes that the people of this country will be impoverished by the proposed nuclear reactors. WHY are certain people so keen to compromise our sovereignty and embroil South Africans in complicated, risky, expensive, extremely-long-term contracts with another state, while keeping us from knowing anything about the ‘deal’.”SAFCEI Board member, Buddhist Ani Tsondru. ”This nuclear deal poses an enormous corruption risk. It is happening in secret and will make the arms deal look like a walk in the park.” SAFCEI’s vice chairperson, Moulana Riaz Simjee. “SAFCEI believes that the government’s current approach to energy infrastructure investment is outdated and that it is immoral to commit scarce public funds to propping up an energy system that can no longer serve the interests of the people of South Africa.” Sean Brown, Operations Director for SAFCEI. SAFCEI has augmented their anti-nuke vigil by appointing legal counsel to demand accountable and transparent decision making by government officials as required by the legal framework and spirit of our constitution. For a comprehensive background to the actions being taken by SAFCEI to encourage President Zuma and his government to rethink nuclear and to open up the investment opportunities for renewable energy, have a look at the links to articles and letters below.